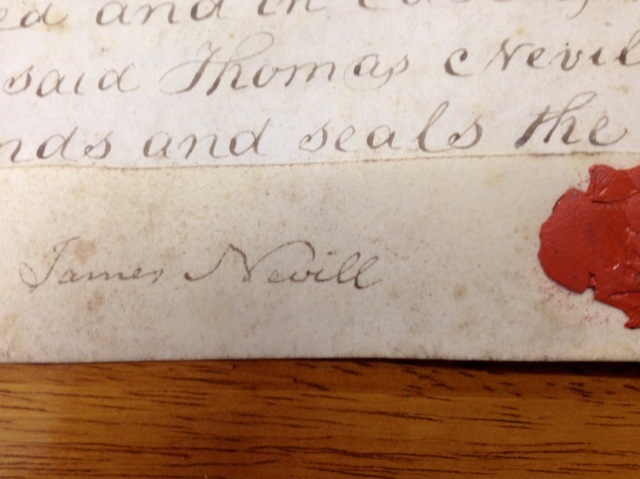 The signature of James Nevill of Wigam from 1808! I attended the National Genealogy Society Conference in St. Charles Missouri. I have been doing genealogy for a long time! I can still walk away with new ideas! David Rencher asked, “is it a good idea to circle the wagons?” I have known David for several years and if you want to learn how to research Irish records take a class from him. I started my Neville research with a photo and obit for my great-grandfather John Neville. He was left in Ireland as a very small child (age 3) when in 1850 his parents immigrated to America. Along my journey I learned that there were 2 brothers left in Ireland. When my husband and I traveled our first time to Ireland I discovered cousins still living outside of Tullamore, County Offaly (Kings). On that first trip to Ireland I found the marriage record for John Neville’s parents Abraham Neville and Margaret Molloy in Rahan parish just west of Tullamore. And the baptismal records for their four children. I also met cousins that told me about the family moving from Mountmellic about the time of the Troubles (1798). Last summer I found an abstract of a deed for a William Nevill from Mountmellick dated 1743! From my earlier research I had found an 1802 Protestant Census for Lynally Church of Ireland that listed my family; William and wife, children: Jane, Joseph, Abraham & William. That all fit nicely together. So I had a family group for Abraham who was born about 1797. I had found William in the Tithe Applotment Records having 46A in Lynally, which was a good size farm for 1828. Last year in Ireland I was able to go to the Quaker Library in Dublin. They e-mailed me the 77 entries for Nevill/Neville family. There was only one Nevill family in Mountmellick and I was able to piece together the family. This week I wanted to really stop and look at the family and examine exactly what do I know about them. What documents and sources do I have to support my research. Stop and reexamine and understand what do you have! I decided to create a timeline on a spreadsheet. Looking at each person and where did I find the information and what document supports each name and date. Do I know the history of the time period that they lived. And who were the people that they were associating with. Who were the witnesses on the deeds? I found a small reference saying Bagot to Neville 1708. I had my lease of John Bagot of Ard and William Nevill of Mountmellick the elder, cloathier. So I contacted a friend in Dublin and request the document. This document is listed “The Laois Papers – Deeds”. “In the 1990’s the Genealogical Society of Ireland came into possession of a large collection of papers which ad originated in a solicitor’s office in County Laois, formally Queen’s Co. Ireland. I received an e-mail yesterday! They had mislabeled the year – it should have been 1808, but I almost fell out of my chair. This document is “This Indenture made the 18th day of March in the year of Our Lord One Thousand Eight Hundred and eight. Between Thomas Neville Bagot of Ballymoe in the County of Galway Esquire of the one part and James Neville of Wigan in the County of Lancaster in that part of the United Kingdom Great Britian and Ireland called England, Merchant of the other part.” It references my earlier lease of lives and then goes onto James naming his wife – Elizabeth Wattis, and naming 3 of his own children. So in this one document – I have 4 generations of Nevill family! James Nevill has moved to England and married. But this document that has been folded away since 1808 ties the families back together! The Quaker records are amazing! Taking time to stop and reexamine each document and looking at the family in a timeline has uncovered a whole new branch of the tree. I have found several trees with James and Elizabeth Nevill in England, but none have parents for James. I can take James back three more generations! That is what makes genealogy so much FUN!